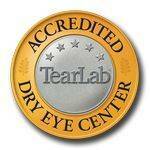 Home » Eye Care Services » Dry Eye Center » What is Dry Eye? The term dry eye encompasses a constellation of signs and symptoms. Dry eye (Ocular Surface Disease) has traditionally been believed to be primarily due to a lack of watery tears produced by the lacrimal gland above the eye. More recently, the complexity of the tear film and ocular surface has become increasingly apparent.